Moscow is Russia's capital; this city has a storied past, beautiful buildings and churches, and has everything you need from a bustling concrete jungle. I was here for around 5 days and felt that I needed more time to see everything. Moscow is one of the biggest cities in Europe with its around 20 million inhabitants (including its metropolitan area). This sprawling urban jungle has a mix of old and new, centuries old churches and structures mingle with skyscrapers and Soviet-era buildings. There are fast food chains (McDonald's and the like, local cafes serving local and international cuisine, museums, galleries and theaters. It is also the center of political, cultural and economic power in Russia. The history of the city dates back to the 1100s. The city is too big to explore in just a few days, I made most of time seeing the places that were high on my list. I would definitely go back if given the chance. The iconic St. Basil's Cathedral is the most recognizable structure in Moscow. This centuries old church is characterized by its colorful, onion-shaped domes and a flaming red exterior. This centuries old structure is a UNESCO World Heritage Site along with the Kremlin and Red Square. Entrance Fee: Entrance fee to enter the church is RUB700 during low season and RUB1000 during peak season. How to Go: There are metro stations nearby these are Biblioteka Imeni Lenina, Aleksandrovsky Sad and Teatralnaya. This square is popular with both local and foreign tourists. Many make their way here throughout the day to visit the museums, walk around, take photos or just admire the beautiful architecture. You'll see several shops, cafes and restaurants all over the area. The Kremlin is the country's seat of power until today. Some parts of this fortress are open to tourists such as Cathedral Square and the Armoury. I was only able to visit Cathedral Square; here, you'll find centuries old churches that have beautiful and well-preserved religious icons. You can also find tombs of former kings and royalty. This beautiful department store used to be state-owned, now it is a symbol of the country's capitalism and consumerism. There are plenty of shops, restaurants, theaters and cafes inside. Shop till you drop here or just eat after exploring the city. This old and beautiful cloister looks like a fortress from the outside, but once you enter, you'll see the typically colorful churches of Russia. The convent was founded in the 1520s. This UNESCO World Heritage Site was currently under construction when I went, but you could imagine the size and beauty of the buildings found here. How to Go: Alight at Sportivnaya metro station, then walk towards 10-letiya Oktyabrya Street then make your way to pl. Novodevichyego. Then turn left at Novodevichyi Prudy. Ask around if you get lost. This eye-catching building was only a reconstruction, but the original was built in 1667. The complex had around 270 rooms that had detailed carvings and paintings. The palace had separate sections for males and females. The palace was reconstructed in the 90s following research made about it. How to Go: This palace is found inside Kolomenskoye Park, you can alight at Kolomenskaya Station or at Kashirskaya Station. You can walk to the park and follow directions inside to find this attraction. This sprawling estate traces its history back to the 16th century. It has changed owners several times since then. Its most remarkable owner was Catherine the Great who bought the estate in 1775. Fast forward to today, the complex was restored and was designated as a protected historic zone. It's a nice place to walk around and imagine what life was like centuries ago. How to Go: The closest station is Tsaritsyno, you can just walk to the estate once you get out. Kolomenskoye Park is a great place to visit to get away from the frenetic pace of the city. This green space has walking trails where locals go jogging or just simply taking a leisurely stroll. You can also find the UNESCO World Heritage Site Church of the Ascension. The church has a long history dating back to 1532. The structure marked a different stage in Russian design. This attraction was the first tent-roofed church constructed in stone. How to Go: The park is within walking distance of Kashirskaya and Kolomenskaya Stations. This complex is a UNESCO World Heritage Site and is home to some of the most beautiful churches and religious icons in Russia. If you have time, try to include this destination to your itinerary. How to Go: This is a possible day or half-day trip from Moscow. You can get here by train, buy the ticket online for convenience. Book here: https://pass.rzd.ru/main-pass/public/en. Moscow's subway stations can be attractions. You'll find chandeliers, art and statues inside. I took the time to stay a bit longer in some of the stops I made. I walked around Moscow most of the time and found some places of interest along the way. The city has the usual chaos of traffic, pollution and wires overhead found in some of the places I've been to. Moscow has character, that's for sure. I found Moscow an easy city to navigate, a lot of the attractions are near metro stations or only a few minutes walk from them. 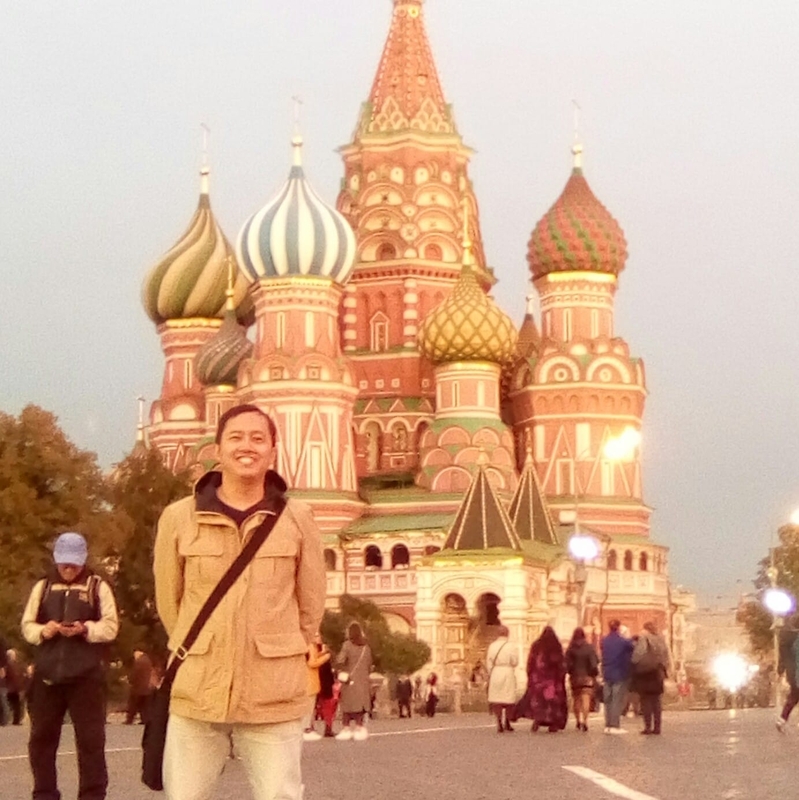 I enjoyed walking everywhere, I walked from Entusiastov Boulevard (from Netizen Hostel) all the way to the Kremlin. I recommend getting a stored value metro ticket and just top it up whenever your credit runs low. I stayed in two hostels Fasol Hostel and Netizen Hostel. Both were conveniently located near a metro station. The area near Fasol Hostel had more grocery stores, restaurants and other business establishments. Both were clean and had decent facilities for the price I paid (I stayed in the dorm). You can buy a ticket online through https://aeroexpress.ru/en/aero.html. *Everything's in Russian Rubles unless otherwise stated. *That is roughly Php 10400; the exchange rate varies so check when you go. A translator is your friend, download an online one for your trip. If you're booking train tickets to other cities, better to book online. Get a map (physical or online one) of the metro stations to make it easy to explore the city and find attractions. Bring USD or Euros for money changers; I had a difficult time to change other currencies to RUB. You can also use your international debit or credit cards to withdraw money.